A songbook with a music CD inside! An 88 page songbook -- including a Georgian music CD -- and more! Learn to Sing Georgian Songs! 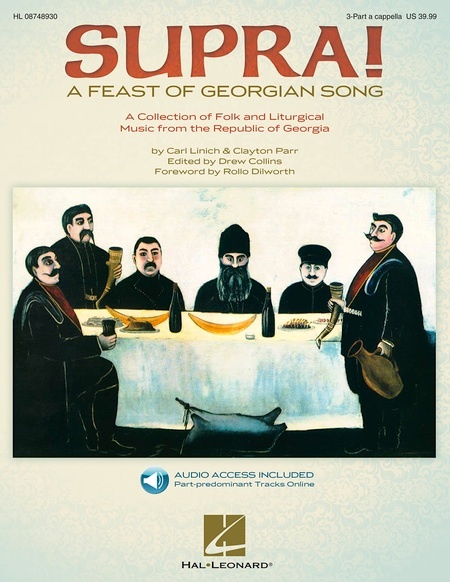 Traditional choirs, folk ensembles, families or any trio, or larger group of singers will enjoy this collection of songs from the Republic of Georgia, selected, notated and recorded by Clayton Parr and Carl Linich. Includes printed music for 18 songs, lyrics and translations and an accompanying audio CD which contains a performance of each song recorded by Ensemble Alioni and friends. Plus, part-learning recordings for each voice are provided FREE online. (Information on how you will easily access the part-learning files online is included with the book & CD.) Working with the part-recordings and the sheet music make it quick and easy to learn or teach these unusual songs! 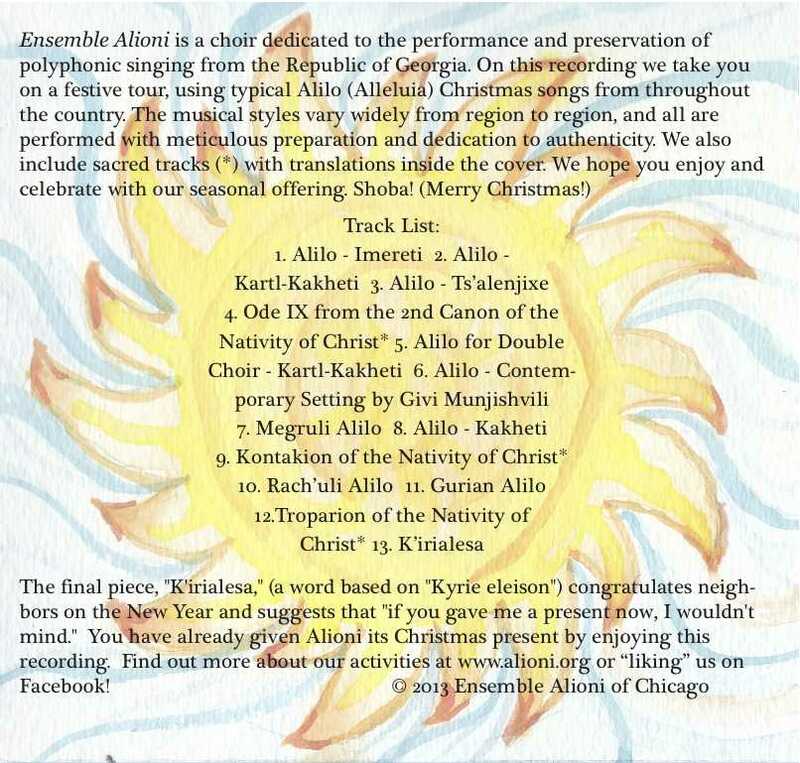 You will also enjoy the lively 45 minute music CD of Ensemble Alioni and friends which is included with the songbook. Imagine hearing a concert of beautiful Georgian music performed just for you! And, you can learn and sing-along with all the songs! Like folk songs from the rest of the world, Georgian songs are connected with events of daily life – work songs, laments, lullabies, songs about historical events or figures, ritual songs, healing songs, traveling songs, comic songs, and dance songs. The category of Table Songs and the tradition of the Supra (a ritual banquet with elaborate toasts and singing) are an important musical genre which occupies a central position in the culture of the Republic of Georgia. Traditionally, Georgian songs are in three polyphonic voice parts, and the authors have provided many pedagogical tools for learning: printed music and lyric sheets, pronunciation guides, song backgrounds, plus audio recordings. Click the arrow > below to listen to a short audio sample . . .
Hal Leonard Publishing -- Click here! JW Pepper -- Click here! so you might hear a Georgian Christmas song in every season of the year! spanning the many styles of Georgian song! Click on the front cover image to enlarge. Click on the back cover image to enlarge. Click the arrow > in the box to play each music sample below! Order it on CD -- or get it now as a Digital Download (see below)! CDs $15.00 each -- postage and handling included. Want to receive the Alilo recording instantly? Please support independent musicians by encouraging purchases rather than unauthorized duplication of this recording. Click the > arrow in the box to listen to a sample of "Dzveli khelhkvavi." Sorry -- only available for purchase at our concerts! The ensemble's inspiring goal is to study singing in the Republic of Georgia. Georgian master singers, and brought knowledge and songs back with us. Please make a donation today... Any amount will help us. 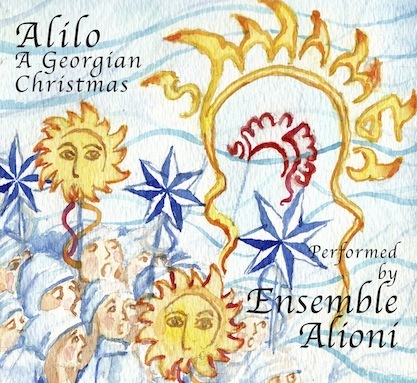 Support Ensemble Alioni in our work of singing and teaching this spectacular music!